1 May - I haven't spent any time by the pond during the day, but I was going through the pictures I took yesterday and came across this one. While I was watching the shore-flies this springtail 'popped' into view just long enough for me to get this photograph. 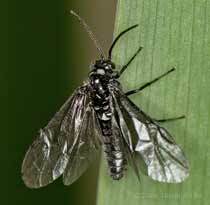 The fly, at about 1.5mm in length, is over twice its length. 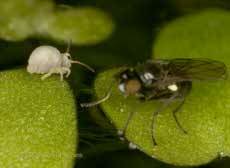 It was a pity that the fly's head wasn't in the same focal plane as the springtail. 3 May - Just like the rest of the garden, the pond hasn't received much attention these last few days. I didn't really spend time by it today, but I did notice what has become a regular here now. 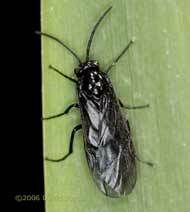 It is a sawfly, Rhadinocerea micans, the larvae of which relies entirely on the Flag Iris as its food source. There were two of them, and I think they must have emerged this afternoon. Last year they first appeared just one day earlier. 4 May - On the warmest day of the year so far the frogs were out of the water, around both ponds. In the small pond the favourite place seemed to be the only ornament that we have in the garden. 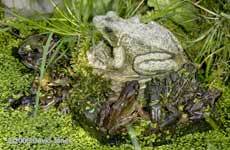 Look carefully and you will see nine frogs. 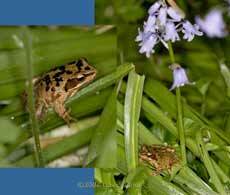 7 May - While you are guaranteed to see frogs in and around the ponds during the day, at night they are just as likely to turn up anywhere in the garden. Last night, these immature individuals were hunting amongst the Blue Bells around the base of the Birch tree. We can do with all the assistance they can give at the moment to deal with the burgeoning population of slugs. While the mature newts are busy either mating or hunting in the two ponds, spotting them hunting away from the water is much more problematic. 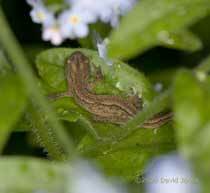 With its skin dry, this young newt looked more like a lizard as it searched for prey about a foot up from the ground, amongst the foliage of the Forget-me-Not plant pictured in yesterday's garden diary. I had just a brief look at the pond during the day, but was puzzled by the behaviour of this male newt. It was partly out of the water and, unusually, didn't dive out of sight when I came close. Notice the tiny Shore-fly to the left of the newt. I decided to investigate, and removed it from the pond. The problem was only too obvious - it had become another victim of the pea-cockles. 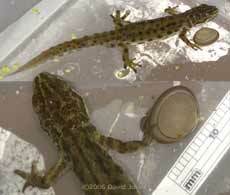 The cockle was firming clamped onto one of the digits of a front foot, clearly causing the newt some distress. I considered trying to remove it, but that would have probably have caused much more distress. I returned the newt to the pond, where I would expect the cockle to release its grip eventually when it need to feed. 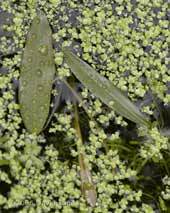 8 May - Over the last two days, the leaves of Pondweed (Potamogeton sp.) 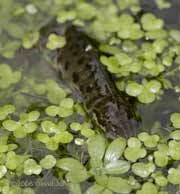 have started appearing in the big pond. Much of the water's surface is now covered by vegetation so it is becoming less easy to see nest activity on the bottom. The fact that the newts lay their eggs on this vegetation means that I will be very reluctant to clear any of it for the next few months. Incidentally, although I don't thing I've mentioned it, there has been a great deal of newt activity in the small pond. They have laid eggs there before, but this year seems to be the busiest yet in there. Another picture of the sawfly, Rhadinocerea micans. Unlike the previous images, this one show the sawfly with wings extended. I'm not sure if it a newly emerged example that is still 'pumping up' its wings. It really does seem to have become established here now, and I'm seeing them daily. In the past I have had only occasional glimpses of the adults. 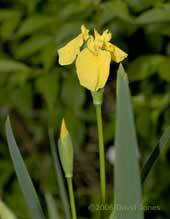 Over the weeks to come I shall be watching out for the larvae on the Iris leaves. When they fly, the adults flutter about like small moths. 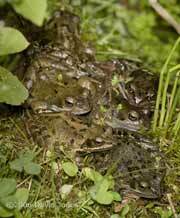 9 May - Five days ago I included a picture of frogs in the small pond. Today it was the big pond that saw this gathering on its northern side. It was difficult to be sure of numbers without disturbing them, but I'm sure that there were at least nine involved. It's funny the way they come together like this. This is a favoured spot, but there are others on that side of the pond, but they were either empty or occupied by individuals. 26 May - just a note to record the opening of the first Flag Iris flower. It looks as though quite a few will open over the next few days, and we will miss them.